Top 10 Moments of the Last Week | House Unseen. Life Unscripted. 10. My whacky Cecilia (16 months) dancing to the Schlitz Creek Bluegrass band at our parish fish-fry. 9. Discovering the historic Park Theatre down the road from our house and imagining how fun it would be if my kids someone were to have their wedding reception there. 8. Trying to get shots of my kids sliding down this slide without getting kicked in the face. The things I do for art! Some might even consider me a sort of, you know, martyr. 7. The small ones insisting on wearing their super-duper flotation device swimsuits to "swim" in this inflatable boat. Safety first! 6. Finding my kids in this tree. Most importantly that my oldest was sticking her tongue out for no apparent reason and I caught it on "film". 5. I know you already saw this, but ohmygod...does this not make you laugh? 4. These two babies, who insisted on sharing a chair so they could share their after-swim snacks. 3. Finding this monument and then catching the boy sneaking up on the girl. 1. Rounding the corner during our annual parish procession and seeing the bay of Gull Lake glistening below us. Summertime: it's better in Michigan! I knew people would be wearing pants there! That lady would be running to that lake if she were wearing pants in Texas. Yes, I do have an unhealthy obsession about the heat. All I could think about during each of these adorable photos of your kids is that it's so mean if you to make them be outside, especially that metal slide! But, you are in the north were I bet it was 107 today. I'm jealous girl, great shots. I'm coming to Michigan! I love the shot of your boy sneaking up on his sister, such awesome childhood joy! #5 cracks me up, I LOVE IT!!! The slide picture was pretty cool as well! I heart #4!!! hope your internet house has a spare bedroom cuz I wanna go to Michigan for my summer vacation! I love outdoor processions! A cope and a biretta! I love it! Charles sometimes wears his beret when it is pouring rain and we are having a procession or an interment. Your family is so much fun, Dwija. I love all the pictures. I can't imagine how loud and joy-filled your home is on a daily basis. Also, those super duper flotation device swimsuits crack me up. Danica has one too and I can't help, but laugh at the way they look in them. It's so ridiculous, but man are they effective. Such sweet, fun pictures! Got to love that summertime! oooohhhhhh ... I love the lake!! Beautiful! Precious/humorous/memorable moments captured. Thanks for sharing. I also risk personal harm in the name of art..., like standing in the middle of a street. Typically this is in a small town where I could theoretically stand for 15 minutes without a single vehicle crossing my path. Way better in Michigan! I spend time each day imagining what our summer would be like if it weren't too hot to go outside. I envy you your cool days and soft grass. We totally just hung out! You guys have so much fun. Yes, you're totally an artistic martyr. And that cute dress!!! The procession looks beautiful... especially with the lake! Hello!! I am in Grand Rapids, and stumbled here via Oh! Amanda, which is awesome because a few weeks ago I pitched a huge online fit about wanting to go back to the old days of blogging and got all fired up and started a Michigan Mom Monday to try and introduce Michigan bloggers to each other. Plus there is a West Michigan blogs group you should probably know about. Plus I'm Catholic. Plus I drink beer. This looks like an amazing week to me. I want to come to Michigan and soak up your family's joy and fun! I have finally made it to the august posts! And I love how c's jumper is all jacked up due to those dancin moves!! Man my parish is in the city and yours is on the water! I'm so jealous! 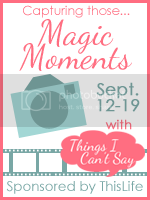 Love your magic moments and love your tag line! The picture on the slide is awesome! Greats pics and magic moments. Love your little one dancing. Fabulous moments, gorgeous photography and perfect captions- love it all!! You caught some great moments! My daughter is 16 months as well and she also has wispy hair.